Mayor Martin J. Walsh, the Friends of Christopher Columbus Park, and the Boston Parks and Recreation Department will join together to celebrate the 16th annual lighting of the park’s signature trellis on Monday, November 19, beginning at 5 p.m. 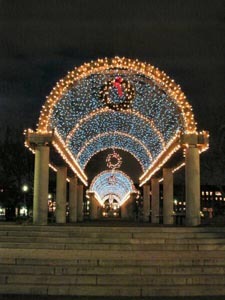 Located at 110 Atlantic Avenue on Boston’s historic waterfront, Christopher Columbus Park is transformed into a beautiful holiday display when the park’s 260 feet of trellis are illuminated with 50,000 blue lights along with 14 decorated trees near Tia’s, the Marriott Long Wharf Hotel, and throughout the park. Entertainment will be provided by students and instructors from the North End Music and Performing Arts Center, Berklee College of Music vocalist Natalie Daniela Castro Diaz, singer Sharon Zeffiro performing a selection of holiday classics, and special guests Santa Claus, Rudolph, and Frosty. In addition, the Postmaster of Boston Nicolas Francescucci will unveil the new US Postal Service holiday stamp. Refreshments, holiday treats, and giveaways will be provided by the Marriot Long Wharf Hotel, Joe’s American Bar & Grill Waterfront, HP Hood LLC, Drake’s Cakes, and Magic 106.7. For more information on the Trellis Lighting, please call (617) 635-4505 or visit the Friends of Christopher Columbus Park at www.foccp.org/ or the Boston Parks and Recreation Department on Facebook or at www.boston.gov/parks.